Whole muscle glycogen levels remain low for a prolonged period following a soccer match. The present study was conducted to investigate how this relates to glycogen content and particle size in distinct subcellular localizations. Seven high-level male soccer players had a vastus lateralis muscle biopsy collected immediately after and 24, 48, 72 and 120 h after a competitive soccer match. Transmission electron microscopy was used to estimate the subcellular distribution of glycogen and individual particle size. During the first day of recovery, glycogen content increased by ~60% in all subcellular localizations, but during the subsequent second day of recovery glycogen content located within the myofibrils (Intramyofibrillar glycogen, a minor deposition constituting 10–15% of total glycogen) did not increase further compared with an increase in subsarcolemmal glycogen (−7 vs. +25%, respectively, P = 0.047). 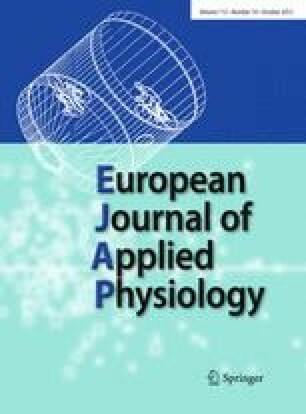 Conversely, from the second to the fifth day of recovery, glycogen content increased (53%) within the myofibrils compared to no change in subsarcolemmal or intermyofibrillar glycogen (P < 0.005). Independent of location, increment in particle size preceded increment in number of particles. Intriguingly, average particle size decreased; however, in the period from 3 to 5 days after the match. These findings suggest that glycogen storage in skeletal muscle is influenced by subcellular localization-specific mechanisms, which account for an increase in number of glycogen particles located within the myofibrils in the period from 2 to 5 days after the soccer match. The online version of this article (doi: 10.1007/s00421-012-2341-9) contains supplementary material, which is available to authorized users. The authors would like to acknowledge the players and their elite soccer clubs for the participation. We would also like to thank Kirsten Hansen, Karin Trampedach, Benthe Jørgensen, Christian Hasson, Fedon Marcello Iaia, Ian Rollo and Sarah R Jackman for excellent technical assistance. This study was supported by grants from The Lundbeck Foundation, Team Denmark (Team Danmark) elite association and the Ministry of Culture Committee on Sports Research (Kulturministeriets Udvalg for Idrætsforskning).